A middle-aged postal worker on the verge of a nervous breakdown gets some imaginary intervention in the form of French footballer Eric Cantona in Ken Loach’s Looking for Eric. A magical realist comedy that flirts uncomfortably with serious drama at times, the film sees its veteran director fouling due to an unsure grip on his material. The working-class Manchester backdrop here is about as convincing as that in any of Loach’s work, but it is put in the employ of a goofy, haphazardly constructed plot. Screenwriter Paul Laverty has pushed Loach to explore genre filmmaking before, often with worthwhile results, but here the attempt is to mount a feel-good kitchen sink fantasy, combining elements of comedy, character-driven drama, and social commentary. The movie, which begins with a comic pillow fight, is introducing guns into the equation by its final act. The uneasy meshing of tones never quite gels, resulting in a movie that works better in the moment than as a piece. Looking for Eric is too cute by half. Its plot, for example, is kick-started in a silly scene during which a group of burly Manchester men set up a meditation session, but quickly devolve into slinging insults at one another. This comic bit prompts the film’s central conceit, which involves the mentally unhinged Eric’s invocation of his idol, Manchester United soccer star Eric Cantona, who soon becomes something of a self-help book for the struggling postman. A scene where Eric and his imaginary mentor dance to Elvis is similarly misjudged, but rather typical of the mindless humor that Loach attempts. So much of Looking for Eric is dependent upon the audience’s willingness to find Eric and his situation to be cute, but Loach’s realist tendencies work against such an impression. At times, Eric is a delusional and destructive presence, but time and again the film wants us to only focus on the whimsy in his characterization. It becomes difficult for a viewer to compartmentalize their responses to this character, who is more complicated than the movie’s genre needs him to be. The friction between character and script is never really reconciled, negatively impacting both. 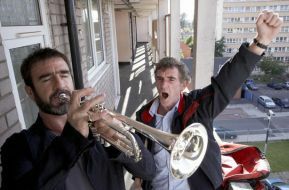 When Cantona is shown playing a trumpet as the camera takes to the city streets, it becomes obvious that Looking for Eric is meant to be Loach’s ode to the spirit of Manchester’s working class. The film is heartfelt on that front, and generous to its characters, but it dictates how the audience is supposed to feel at every turn. One could surrender to Loach’s manipulations, and probably enjoy the film, but the mishmash between its conflicting messages only intensifies as the third act sees the film become a preachy screed against gang violence. While parts of Looking for Eric, such as the title character’s heart to heart with his first wife (Stephanie Bishop, who gives the best performance in the film) are well-mounted and well-acted enough to remind viewers why Loach is considered a master filmmaker, such scenes only work when judged in isolation. Placed into the overall context, any given scene in Looking for Eric might as well have come from a different movie. The central trauma here, of realizing, at age fifty, that major mistakes have been made, is the stuff of real drama. To have this subject watered down with cheap physical comedy, irrelevant flights of fancy, and pat political tracts is disappointing.